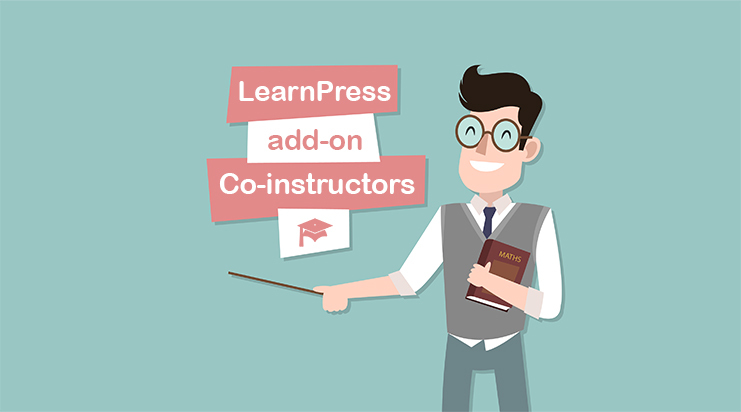 View cart “Coming Soon add-on for LearnPress” has been added to your cart. 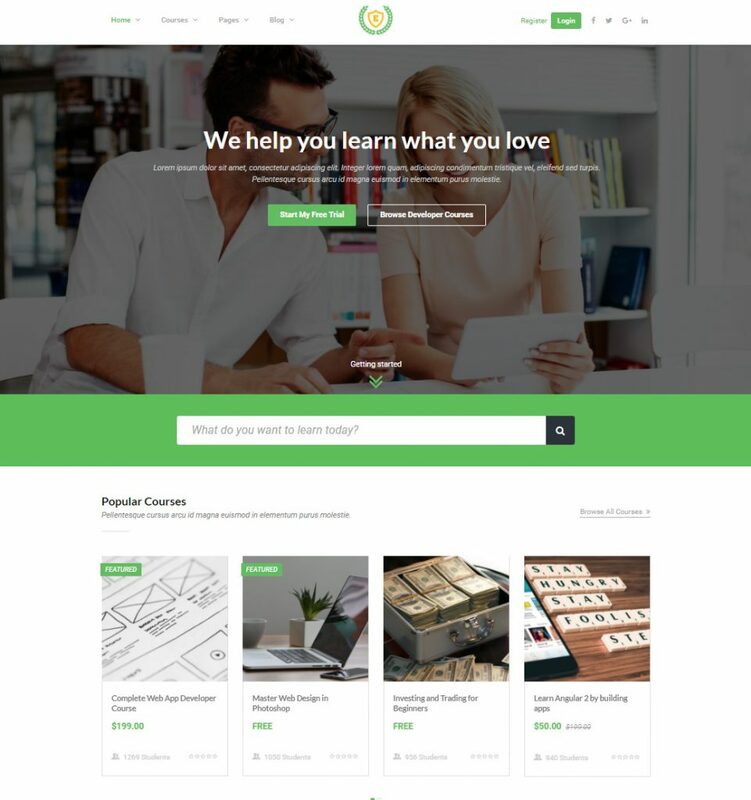 Education Pack is a beautiful, clean and free education WordPress theme for any university, schools, training centers or even instructors, coaches. It can also be used as an elearning portal and Learning management system (LMS) for schools and corporates. 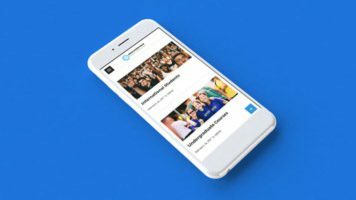 For the fastest load speed, Education Pack used a built-in slider which minimize everything to optimize speed while still ensure an appealing appearance to the site. 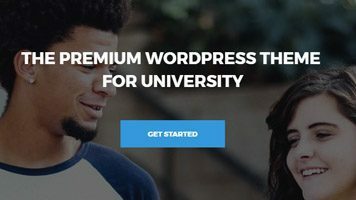 Take a look at the preview University WordPress theme demo, you will be amazed by the smart and elegant gallery layout. 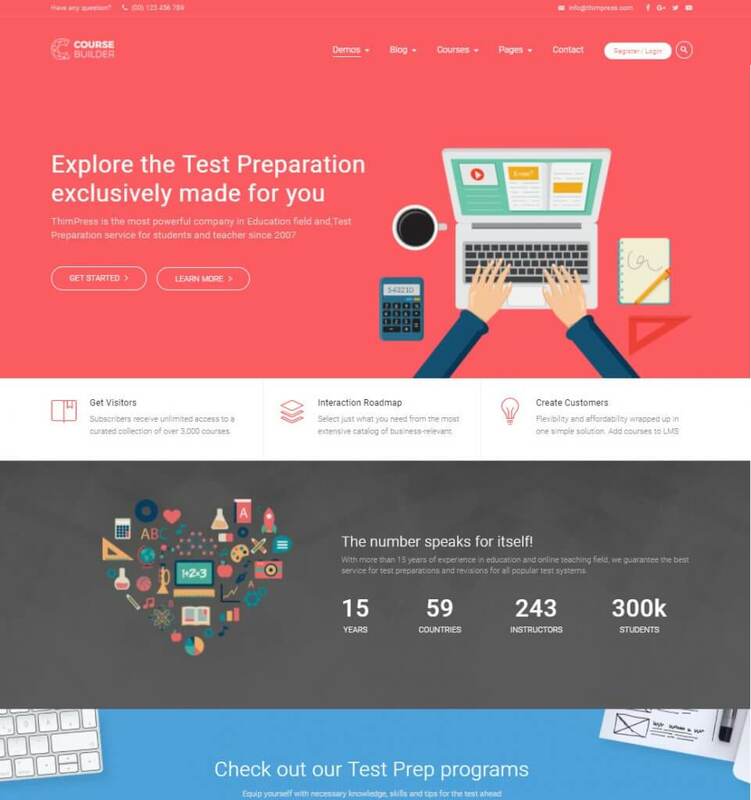 Education Pack Education WordPress Theme allows you to exploit the visual effect of Parallax to make your site more attractive. You can make your website more lively with this feature and impress your audience. Showing testimonial on your website is a sure way of building trust and getting more clients. Are you a school or an organization? 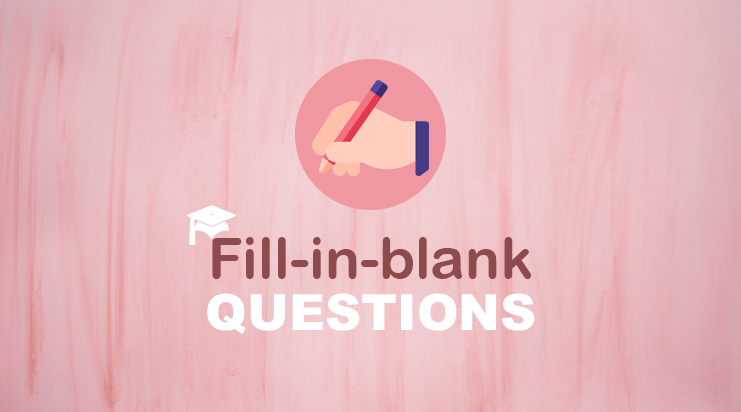 Do you have partner schools or partner organizations? We made a widget for your site to show partner schools to make the site more professional. 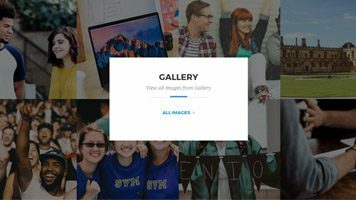 Create any web page you want using the Drag&Drop page builder with live preview and tons of pre-built layouts. Making web pages has never been that easy and fun. No Coding Required. SiteOrrigin is a visual page builder that allows you to create beautiful, stunning pages with little effort. Drag and drop elements into place with precision accuracy. Education Pack's speed and SEO optimization is unmatched. Almost no other theme's speed can be paralleled to this awesome theme: 100 score on Pingdom, fully loaded in less than a second. 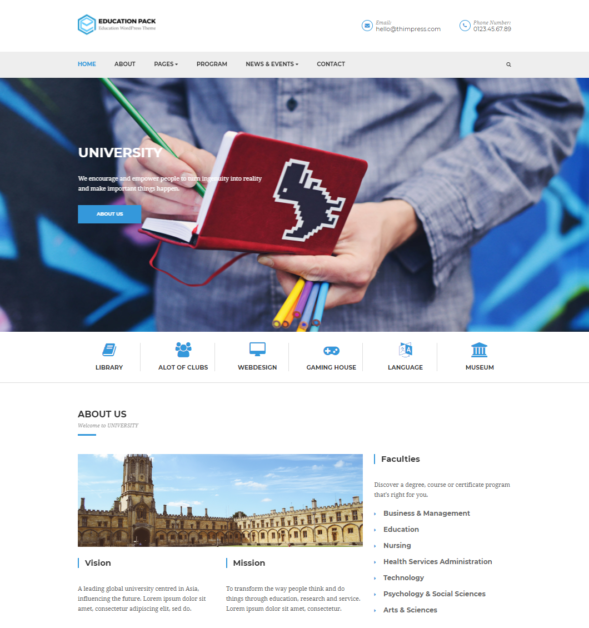 The best thing about Education Pack Education WordPress theme is that while it can be one of the best university WordPress theme, it is FREE and will remain to be a Free WordPress theme forever. With ThimCore, the theme is super easy to install and setup. 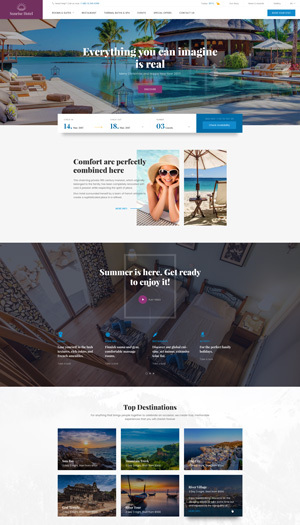 You can quickly install the theme via WP, activate ThimCore and easily import our set of demo pages,posts, sliders, widgets, theme options and other settings with a single click. 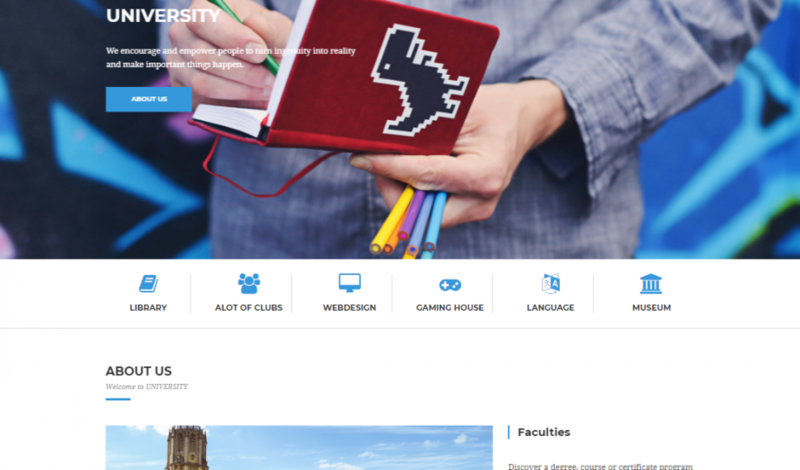 This Education WordPress theme for University, schools and training centers allows you to create unlimited sidebars and you can assign any widgets to each sidebar. A website only shows its full potential when demo content is fully installed. Upon downloading the theme, you will get the demo pack with all demo pages installed. Just click the import button and it will automatically install for you. 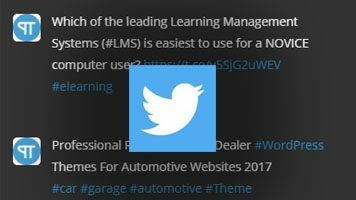 The theme offers unlimited changes to Footer where you can add widgets to change the content and the look of the area. 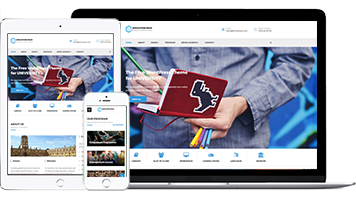 Everybody will have the footer of their wishes with the theme Education Pack. "The theme itself is amazing, what is more amazing is their customer service. If you want a theme with the best customer service, please choose this theme. I am so happy that I cannot express my gratitude in words. Well done! please keep it up, I can see a great future ahead Education Pack team." 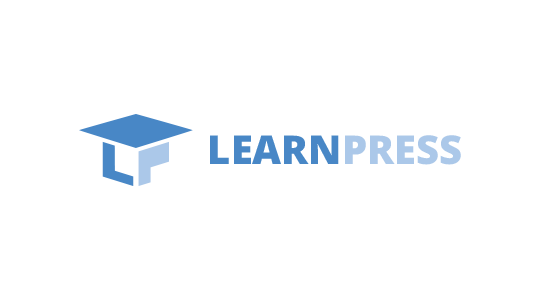 The WordPress LMS demo of Course Builder, the best WordPress theme for Elearning Online Teaching and Schools.